Daniel M. Pedriana | Wisconsin Workers Compensation Lawyer | Lindner & Marsack, S.C.
"Clients want an attorney that is aggressive and at the same time can see the bigger picture which requires being creative and thinking outside the box." Daniel M. Pedriana is a shareholder and member of the Board of Directors of Lindner & Marsack, S.C. His current law practice primarily focuses on defending worker's compensation claims for the insurance industry and self-insured employers. He also frequently handles related employment and subrogation issues. Mr. Pedriana was an in-house attorney for a major insurance company prior to joining Lindner & Marsack, S.C., defending against personal injury, property damage, and worker's compensation claims. He has also handled various related subrogation claims. Mr. Pedriana frequently lectures and speaks on worker's compensation law, along with related labor and employment law and subrogation topics, in Wisconsin and throughout the country. 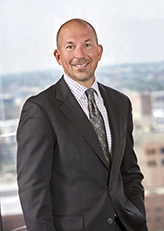 Mr. Pedriana spent two years, during his attendance at the University of Wyoming College of Law, working for the Wyoming Public Defender's office. There, he argued before the Supreme Court of Wyoming. Following law school, he completed a judicial clerkship with New Mexico's Fifth District Court and wrote appellate briefs to the New Mexico Supreme Court. Mr. Pedriana was named a 2009-2012 "Rising Star" by Wisconsin Super Lawyers, published by Law & Politics. Wisconsin attorneys chosen as "Rising Stars" undergo an extensive peer review process and constitute the top 2.5% of attorneys in the state under the age of 40. Mr. Pedriana has a peer rating review of AV Preeminent by Martindale-Hubbell. Mr. Pedriana strongly supports continued education. He received three undergraduate degrees and he is an adjunct faculty member at a local university. Mr. Pedriana teaches classes in labor and employment law, business law, and business ethics.